Description: Massive rounded sponge with large round preoscule which has a sieve-like structure inside it. Grey or off-white in colour. 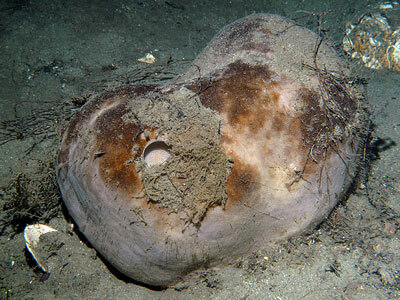 Habitat: Mostly found in deep water, but as shallow as 20m in Norwegian fjords. Distribution: Reported from NW Spain to Norway, but apparently not from Britain or Ireland. Picton, B.E. & Morrow, C.C. (2016). Geodia barretti Bowerbank, 1858. [In] Encyclopedia of Marine Life of Britain and Ireland.